The City of Light is a wonderful destination, even for only a few days. The streets of Paris are full of parks, monuments, sights, small charming restaurants and cafeterias near the banks of Seine. 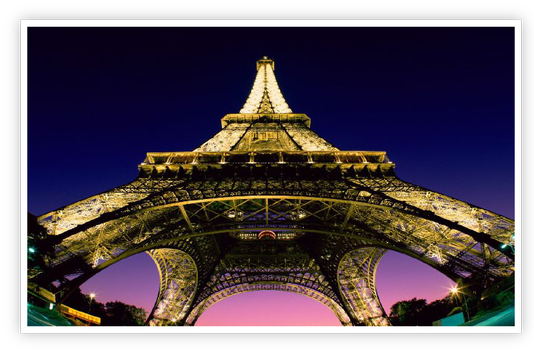 All you have to do is book now your air tickets and visit the renowned Eiffel tower, the Louvre museum, Notre-Dame, the Arch of Triumph and many other monuments and sights. You can also combine in your trip to Paris shopping, because this metropolis can definitely offer innumerable choices and shops. Aegean, Olympic Air, Air France and Cyprus Airways landed in Charles de Gaulle airport (more information below) and EasyJet at Orly Paris Airport (more information below), these two airports are the main airports in Paris. When making plans for a holiday trip to Paris it is better to make a reservation as soon as possible in order to find cheaper air tickets. Many airlines promote cheap flights and announce special air ticket offers for reservations made 1 or 2 months prior the departure. Paris has two contemporary and fully equipped airports that serve thousands of people on an everyday basis. The first one is Charles de Gaulle (CDG)/Roissy, which is located on the south of the city and the second one, is Orly (ORY) which is located on the north of the city. Most international flights are facilitated at Charles de Gaulle/Roissy whereas Orly facilitates mostly domestic flights and some international. Charles de Gaulle/Roissy is the biggest airport in Paris. It has 3 Terminals as well as ultramodern comforts, shops, restaurants and ticket desks for air tickets. It is located approximately 23 kilometres from the center of Paris. The Roissy/CDG - 9 arrodissement bus that makes its final stop in the heart of Paris near the Opera House, departs every 15 minutes from the airport and operates from 06:00 until 23:00. The journey lasts 45 to 60 minutes and costs €9.10. The bus makes a stop in all 3 Terminals of the airport. There are also the buses 350 and 351 that serve terminals 1 and 2. Bus 350 makes stops near Montmartre, Gare du Nord and Gare de l'Est, whereas bus 351 makes stops at Porte deMontreuil, near Place de la Nation and Cimetière du Père Lachaise. The journey costs €4.80. The RER-B3 is the railway line that serves the route Charles de Gaulle/Roissy - Gare du Nord, Châtelet-Les Halles, Denfert-Rochereau, and also 7 other stations in Paris that are connected with the city’s metro. There are two stations at the airport and the trains depart every 10-15 minutes during the week and less frequently during the weekends. The journey lasts 25 to 40 minutes depending on the destination and the ticket costs €8.50. From Charles de Gaulle/Roissy Airport the journey to Paris by taxi, from highway A1, does not last more than 30 to 40 except of course if there is traffic. The taxis must have a taximeter and the journey usually costs around €30 to €60. Have in mind that each suitcase is charged with €1. Orly Airport is located between the city of Olry and the city of Rungis, only 19 kilometres from the center of Paris. There are 2 Terminals at the airport, Orly Sud and Orly Ouest. You can also find, at the airport, many shops, ATM machines, cafeterias, travel agencies and of course ticket desks for air tickets. The journey from the airport to the centre of Paris is relatively short and easy. Orlybus serves both Orly-Sud and Orly-Ouest terminals and its final stop is Denfert-Rochereau station (14 arrondissement), with stops at Jourdan Tombe Issoire, Parc Montsouris and Alésia - René Coty. It is the cheapest way to transfer from the airport to Paris since it only costs €6.40 and it departs every 15-20 minutes. The buses operate from 05:35 until 23:30. From Orly airport there are a few more buses that depart for Paris. More specifically, bus 183 that terminates at Porte de Choisy metro station and bus 285 that terminates at Louis Aragon metro station. The night bus N31 operates from midnight to 05:30 and its final stop is at Gare de Lyon. The ticket cost varies and depends on the destination. The journey from Orly airport to the center of Paris can cost €30 to €45, depending of course on the destination and the traffic in the streets. Each luggage is charged with €1.